With Readly you can read Airgun Shooter Presents and thousands of other magazines on your tablet and smartphone. Get access to all with just one subscription. New releases and back issues – all included. 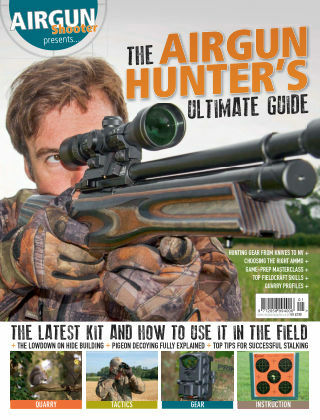 Compiled by Mat Manning of Airgun Shooter magazine and YouTube’s The Airgun Show, The Airgun Hunter’s Ultimate Guide is packed with fieldcraft advice and all the latest hunting gear. Its 116 pages feature detailed reviews of a vast array of kit available to the modern air rifle hunter, from night vision and knives to camouflage clothing and kitbags, along with no-nonsense hunting instruction to show you how to get the best from it in the field. There are also sections on pellet and power choices, and how to select the right optics for the job. The publication features detailed profiles for all the major UK airgun quarry species. Apart from providing vital information on quarry identification, the sections also give a vital insight into the habits and behaviour of target species, so you can stay one step ahead. Successful hunting hinges on an understanding of fieldcraft, and this comprehensive guide provides clear and easy-to-follow instruction on essential skills including hide building, decoying, stalking, static hunting and night shooting with lamps and NV. After equipping you with the knowhow to fill your game bag, there’s even a game prep masterclass, so you can turn the results of a productive hunting trip into meat for the table.